By default, you receive notifications for all replies to your comments. You can also subscribe to entire discussions on which you comment under the Email Notifications settings. Additionally, anyone can subscribe to individual threads via RSS or email in any Disqus embed by clicking one of the subscription links at the bottom of the embed. The option will change color to denote that you've been subscribed. or from specific threads by clicking one of the subscription links at the bottom of the embed. The option will change to gray to denote that you've been unsubscribed. All users (including Guest commenters) can reply to a Disqus notification email with the keyword "unsubscribe" to stop notifications for that specific thread or "unsubscribe all" to be unsubscribed from all Disqus notifications. 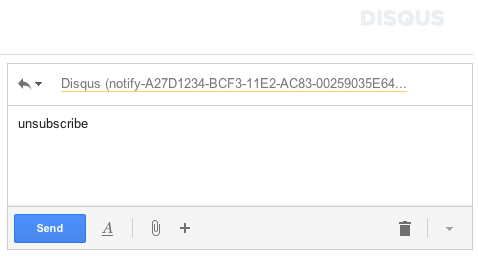 Alternatively, Guest commenters can click the "Stop receiving notifications" link at the bottom of an email notification.